This sword is as wicked as it looks! Featuring a beautiful and sharpened high carbon steel blade with blood groove. 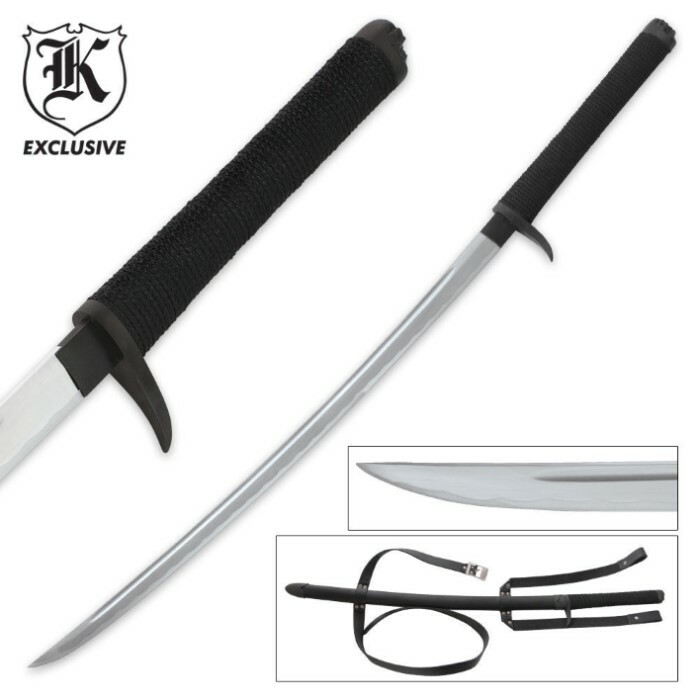 The most eye catching part of this sword is the talon shaped tsuba, designed to deliver blows while protecting your hands. The hardwood handle is wrapped with black cord and bamboo pegs are used to secure the blade. The saya is very solid, constructed with hardwood and metal fittings. 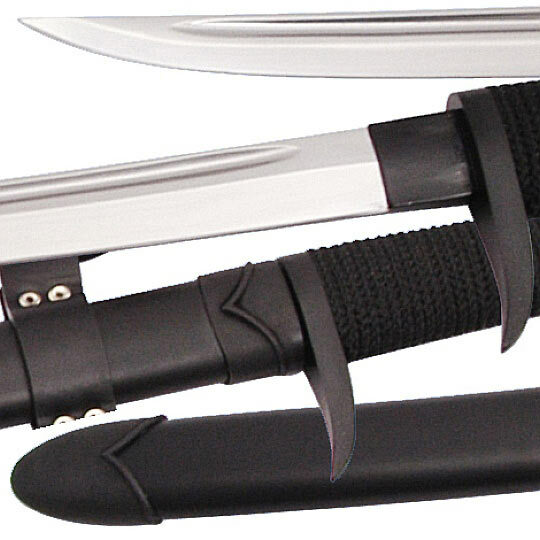 Maybe the best part, this sword includes a high quality double strap system for tactical carry on your back! 41 in. overall, 28 in. blade, 12 in handle. When I first received this I thought it would be a piece a junk. Fooled me! This sword is awesome. I've cut through boxes, bottles, and will be trying it on other things soon. This was my first katana and I am impressed. Only bad thing is it is VERY HEAVY. Other than that a Great Katana. 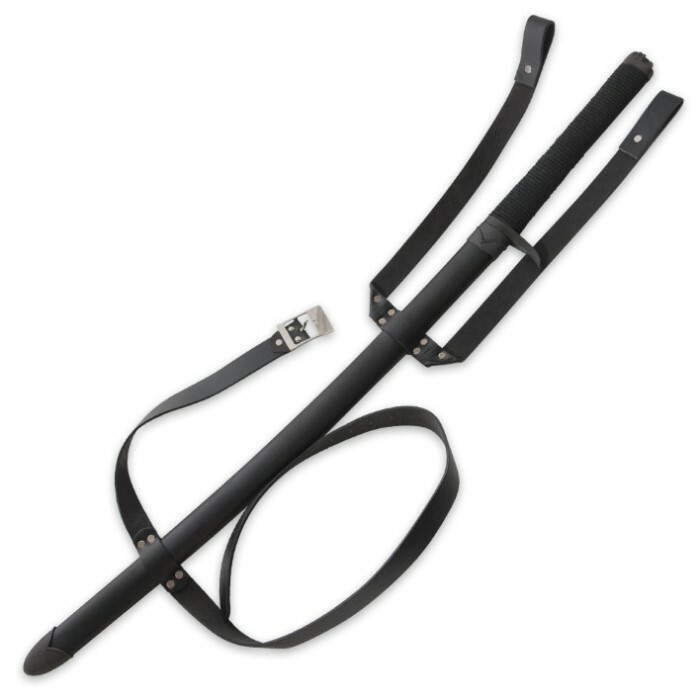 Upon fastening the sheath on my person, the straps broke, the sheath seam to be made out a cheap wood. And is swiftly becoming more and more unusable, and I haven't walked around with it for a hour yet. The blade; it is sharp, however, whoever sharpened it did so unevenly, and chipped part of the edge. Nothing that you can't fix yourself. The blade is fitted properly to the hilt, pommel, and handgaurd. The hilt is a bit wider then expected but still managable, and perfect for those with larger then average hands. Its definitely worth the price. I feel though they could have done a better job on the sheath. Heavier sword than expected ,very thick and a fairly sharp blade when arrived. The sheath is solid very nice with a metal tip that seems to be poorly affixed but the easy removal made the harness easy to remove . Its a better fit for the wall display. The best value yet! Thanks BK. Didn't know what I'd be getting for 30 bucks. This sword is real. Full tang carbon steel blade. Not razor sharp, but sharp enough to cut. It's slightly warped, but not enough to affect its functionality. The handle is longer than I expected it to be. I like the look and feel of the paracord wrapping. Plus, the pommel actually has a skull head on it. The online pics don't show that detail. I removed the straps it came with. I don't plan on wearing this sword anytime soon. Plus, it looks better without them. All in all, great buy for the price. Thanks BudK! I bought one of these a few years ago after being severely let down by one of the cheap $25 ones. It's got great Balance and holds an edge well. And it's a much better blade than a more expensive Damascus sword I bought for my son at the same time. The death talon has not bent or bowed like the Damascus one when I use them for some light tree branches triming. Im a collector of battle ready and vintage type blades of different size and makes, yet out of all the many different blades that i have this one is the one I'd depend on in a real Apocalypse of any kind. Truly a good buy.it should cost more than $50 bucks. All in all the is the blade to have. Maybe my expectations were too high for this weapon but upon a closer inspection there is only one bamboo peg about 3 inches below the tsuba making it very unbalanced and it is not sharp at all. I know you get what you pay for so i will use it to practice movements but i wouldnt trust it to cut anything. Bought this as a gift BOGO sale. Am very impressed with quality to slice branches and melons. Its got a neat little heft to it but makes me want to improve my one handed swing that much more. Thanks BUDK for this on BOGO and would like to know if i can still engrave it? Awesome sword, blade is nearly 1\4in. thick and is durable as some higher priced swords. Pommel and End cap on the sheath rattle just slightly but that's an easy fix(my friend got one as well,his doesn't shake at all.). 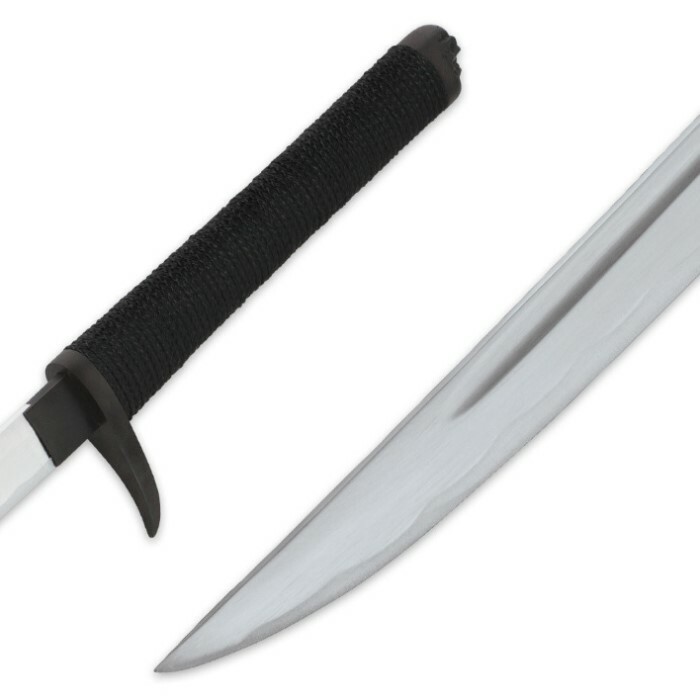 Great sword, Highly recommended, Battle Ready but not Battle-Proof. (It's not your dad's old machete.). Treat this blade right and it will last.